If you’re in need of a quick and easy holiday snack look no further. 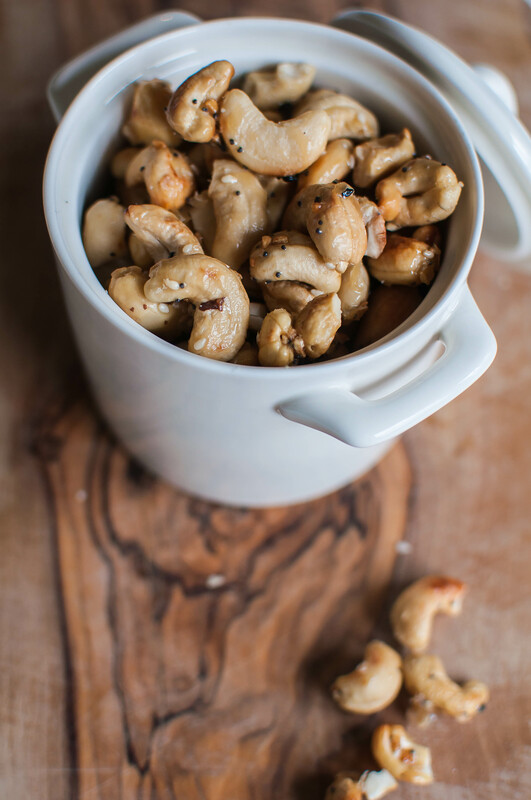 These Honey Butter Everything Cashews take less than 10 minutes to prepare and are healthy to boot. What are your Thanksgiving plans this year? We are going to my parents house this year where we will celebrate with them along with my brother and some close family friends. It’s always a crazy, loud, packed day filled with delicious food and funny stories. With Thanksgiving upon us these Honey Butter Everything Cashews would be great to have around for people to snack on while dinner is being prepared. I’m always thinking about the snacking situation. I also love these Honey Butter Everything Cashews as a slightly savory option to add to your cookie trays this Christmas. As more of a savory person I always think it’s nice to have something salty or savory to cut the sweetness that is Christmas cookies. Not that sweet is bad, I mean it is Christmas after all, but I like having options. Some kind of chex mix is my usual go to but these cashews may be replacing my usual. And I have to mention that you don’t even need to heat up the oven to make these cashews. They get toasted in a hot skillet then tossed with the remaining ingredients. Cook all that for a few minutes and you’re good to go. Seriously, only about 10 minutes from start to finish. They are the perfect snack, last minute treat or Christmas tray filler around. Happy Thanksgiving friends. I hope you are able to celebrate with all your favorite people. Heat a skillet over medium heat. Add cashews and toast, stirring often until slightly golden and fragrant (be careful as they can burn easily). Add butter and honey to the pan. Stir to coat the cashews evenly. Bring to a simmer and allow the mixture to bubble and thicken, stirring often, until it coats the cashews. Stir in the everything bagel seasoning. Pour onto parchment or foil lightly coated with non stick spray and spread out into an even layer. Allow to cool then store in an airtight container.